Rahul Alvares’ claim to fame begins somewhere in the sixteenth year of his life, with the writing of his first book, Free from School. Being the progeny of famous parents, environmentalist Claude Alvares and Padma Shri Norma Alvares, has its upside, but Rahul has managed to carve out a niche for himself that exposes a genetic propensity to stand out in a crowd. An unconventional upbringing may have vastly contributed to his departure from the traditional view of education and his choice of profession, as is well encapsulated in Free from School. After finishing his tenth standard, Rahul was encouraged by his father to take a year off from conventional educational institutes and ‘learn’ from firsthand experiences. This has proven to be one of the best methods of acquiring knowledge with the tools to apply it as well. He travelled the country, gleaning a comprehensive and practical understanding of snake and crocodile farming, spiders, mushroom farming, etc, and recorded the same in his book. Rahul went on to pursue his education and become a herpetologist, who has made it his mission to convince people to reject the stereotypical and irrational fear of serpents. Although he started working with resorts on snake related issues – enlightening staff on the rescue and relocation of snakes and first-aid training for snake bites – and was gaining ground as a herpetologist, he soon chose an alternative career as a guide on wildlife tours in 2004 in order to supplement his income. In the process of adopting a second job, he immersed himself in the delights of bird watching. Commenting on his shift in concentration, Rahul says, ‘Bird watching is immensely addictive and birds are easier to find compared to snakes.’ Consequently, his bird watching has led him to discover beautiful and interesting places in India and foreign countries such as Australia, Borneo, Malaysia, the USA, etc. In 2012, Rahul decided to invest in camera equipment and taught himself photography through internet articles and the advice of photographer friends. He honed his skills by method of trial and error. Birds of Goa, his latest book to be released, was the result of a collaboration with the German Heinz Lainer. Lainer, who has lived in Goa and has been a birdwatcher for thirty five years, had previously produced a book in 2003 by the same title and was planning on a new book on the same topic. ‘Dad asked Heinz Lainer if he would include the photographs I had taken in his book. Then Richard D’souza, who is a conservator in Goa, said, “Why not make it a coffee table book?” and promised it would be funded by the government,’ Rahul informs us. Through the book one can avail of valuable information on the subject of birds. 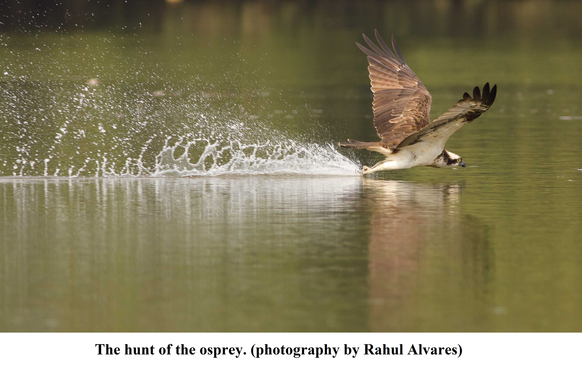 The study of more than 440 species has been recorded with the visual accompaniment of Rahul’s brilliant photography. His lenses have captured regular forest birds such as Kingfishers and Orioles, as well as birds indigenous to mangrove areas, the shoreline and the Western Ghats, in all their natural splendour and beauty. He relates anecdotes of experiences that have stayed with him. 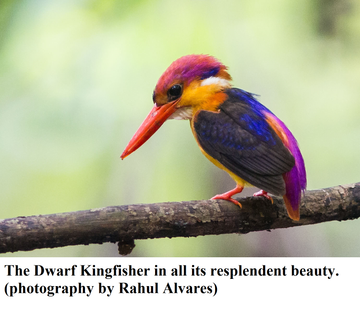 His photography of the Oriental Dwarf Kingfisher was a particularly memorable one. ‘The bird is really, really small…a little bigger than a bee. It was exciting to go try and find the bird. First, I thought it was an insect,’ he says. He kept going back to Siolim to steal some shots, but it was not till his last attempt, which took him two hours and forty five minutes, that he was rewarded with prize winning photographs. The other engrossing story he narrates is about the Juvenile Eagle’s nest he found in Socorro in June, 2014. It was only after the fifth time he had been to the area that he was able to get within seven metres of the nest. The baby in the nest was oblivious to any sense of danger and watched Rahul without fear. It even looked on quizzically at a monitor lizard that distracted it. The mother on the other hand was visibly startled by Rahul’s presence. Rahul continues with business as usual with his wildlife tours for bird watching in North Goa and the Bondla Wildlife Sanctuary, snake watching, etc, besides photography workshops where he shares his knowledge of photography, breaking it down to the level of an amateur. His own photography, meanwhile, remains an avenue for adventure, visiting picturesque places and giving expression to his creativity.